In today’s interconnected world, few homes have less than four Internet-connected devices online at the same time. Many homes have twice that. You need a router that can keep up with all the traffic. Let’s take a look at these two tri-band models from NETGEAR and ASUS to see which one will be the best for you. The NETGEAR Nighthawk X6 is a powerful, fast router well worth the investment because it’s got hardware and software that will keep it current for a few years to come. It has two 5GHz radios and one 2.4GHz radio, and it’s compatible with 802.11 b/g/n and a/n/ac standards. This means all your old and new wireless devices can use it to connect to the Internet. Let’s be a little more specific about that. The Nighthawk has WPA/WPA2-PSK Wi-Fi Protected Access, but not WEP. Wireless devices older than those manufactured in 2004 may have trouble using it if they are WEP only. Besides the wireless connections, the Nighthawk has 5 Gigabit Ethernet ports on its back as well as one USB 2.0 and one USB 3.0. The USB 2.0 is perfect for plugging in a printer so all the computers and tablets in your home can print to it wirelessly. The 3.0 port transfers data ten times faster than the 2.0 port, ideal for connecting an external hard drive for backing up or sharing files over the network. Plus, using the USB 3.0 port doesn’t slow down the traffic over either radio. The included ReadySHARE Vault app runs automatic backups for Windows PCs in your home. You can make use of the FTP server and stream video and music to TVs and game consoles with DLNA. Any device you want to add to the network doesn’t need the password if they have WPS, the one-button push system, to link them. Phones can simply scan the QR code to connect. For persons who want to protect their Internet traffic from prying eyes, the Nighthawk has an OpenVPN server. The powerful quad-core 802.11ac radio keeps up with demand. The SmartConnect feature automatically assigns devices to the fastest available of the two 5GHz channels. The six antennas help the Wi-Fi signal penetrate throughout large homes. You can set up the Guest Network so you don’t have to share your password with visitors. They will have their own separate access and won’t be mixed in with your home network. Finally, when you pull this router out of the box to set it up for first-time use, the NETGEAR Genie app makes it truly simple and easy. If you want to make configuration changes later, the app can do those for you. It also gives you remote access. You don’t need a computer at all. ASUS released the RT-AC3200 to compete with the NETGEAR Nighthawk X6. When it was first released, the original firmware was buggy and needed to be updated to improve the router’s performance. One problem it had was with its implementation of SmartConnect, the software that assigns each device to a channel depending on load. Early owners had to disable this feature because the router kept dropping connections. But the RT-AC3200 has great features even though it had problems in the beginning. For one, instead of just OpenVPN, it also supports PPTP servers. It comes with Trend Micro’s network security package that includes privacy protection and parental controls. If you have an infected device detected on your network, this software isolates it so the problem won’t spread. Other software in the router includes AiCloud that lets you plug in a USB drive and access its files wirelessly. This means you can download and stream to phones, tablets, your Roku, and more. Like the Nighthawk X6, you can also plug a printer into the USB 2.0 port and print to it over the network. There are also 5 Gigabit Ethernet ports on the router for the devices you want to hardwire into the network. And of course, the RT-AC3200 is compatible with 802.11 ac/n/g/a/b devices for wireless connections. Either one of these two routers would be a worthwhile upgrade to an older network router. Either one would be future-proof for a few years. For overall ease and flexibility of use, the NETGEAR Nighthawk X6 takes the prize. The only downside is that there is a potential problem with connecting very old devices that don’t support WPA encryption. If you don’t have anything older than 2004 that needs a Wi-Fi connection, this may be the best router for you. The ASUS RT-AC3200 has the ability to connect using WEP, but that would potentially degrade the security of your whole network. It does offer a PPTP VPN server and explicitly supports Apple Time Machine backups, not just Windows PCs. The early release problems still haunt this router, but if you aren’t put off by having to upgrade the firmware right out of the box, you could save money by purchasing this one. 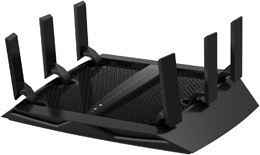 Click here to purchase NETGEAR Nighthawk X6 AC3200 on Amazon.com! 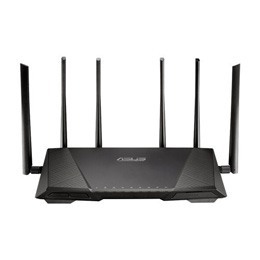 Click here to purchase ASUS RT-AC3200 on Amazon.com!